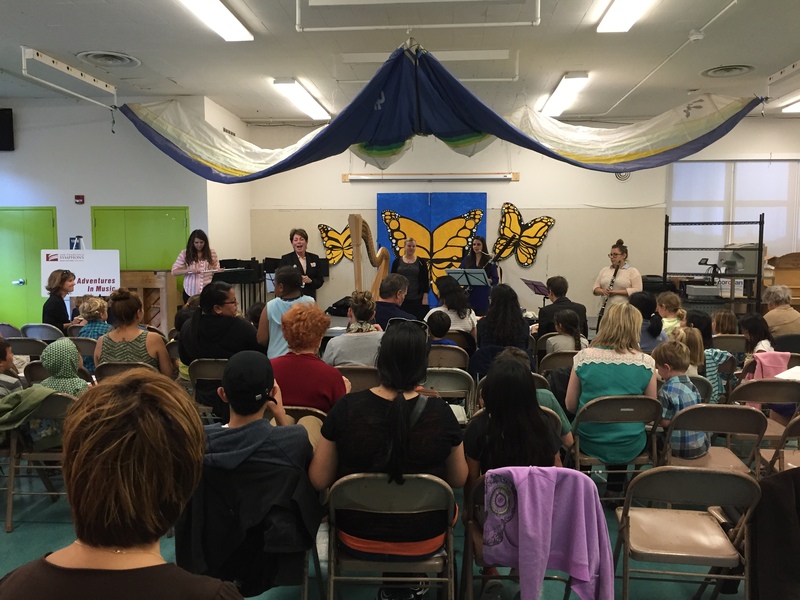 ARTSED4ALL’s project “THE HUMMINGBIRD EFFECT” officially kicked off on Thursday, April 16th with a special Family Art Night performance sponsored by the San Francisco Symphony’s Adventures in Music program. “AIM in the Evening” is a program established by the San Francisco Symphony to allow parents and the greater school community to share the educational performances that the students experience during the day. Family were invited to enjoy a musical performance by Coastal Winds, a quintet of five instruments: flute, clarinet, bassoon, French horn and harp. This 45-minute program demonstrated the idea of musical storytelling to through an original fairy tale: “The Princess of Rhyme.” Harpist Meredith Clark delighted the audience, in her role as the Princess whose voice is stolen by the evil wizard. A light fairy tale-inspired supper, featuring Mary Poppins’ Practically Perfect Tea Sandwiches, Peter Rabbit’s Mixed Greens Salad with Cranberries and Sunflower Seeds, Geppetto’s Tortellini and Alice’s “Eat Me” Cake, was prepared by chefs Megan Wong and Patrick Wu. After the performance, families were invited to leave poems for the Princess of Rhyme in the newly constructed Fairy Village, created by students with the support of retired Rooftop Kindergarten teacher Mary Ann Cruz. Children are invited to leave nest-building materials such as yarn and tiny twigs for the birds in the tiny fairy homes. Families were also introduced to the focal species of birds that reside in Twin Peaks: the American Crow, the American Robin, the house finch, the house sparrow, the mourning dove, the peregrine falcon and the rock pigeon. In Technology class with instructor Andi Wong, Rooftop’s 3rd and 4th graders have been working together to establish a bird-friendly habitat in an area known as the “Mini-Garden,” thanks to a mini-grant from “Celebrate Urban Birds,” a program of The Cornell Lab of Ornithology. This new outdoor lab, poetically dubbed “Mountain Eye” by 3rd grader Cameron Budetti, gives students a place of their own where they can learn how to innovate with Nature, the greatest designer of all. Students are free to discover personal interests, as they collaborate with classmates, exploring the ways that technology can be used to transform ideas into real world action. Students held a ribbon cutting ceremony to officially open the Waterfall Trading Company & Apple Tree Trading Company pop-up shops, student-led efforts to engage community recycling and repurposing. Families enjoyed the magical view from Raven’s Lookout, and the musical sound of conversation and laughter filled the air. The evening ended happily ever after, as the children of Rooftop School helped The Princess of Rhyme to find her voice once again. Visual artist FLO OY WONG loves poetry. At the age of 75, Flo set her sights on becoming a poet, and she has worked diligently to master the art of writing poetry. To quote the National Center for Creative Aging, “There is no doubt Mrs. Wong will carry out her plan to keep working as long as she is able to do so.” A vibrant elder, Flo dives into new challenges with whole-hearted gusto. 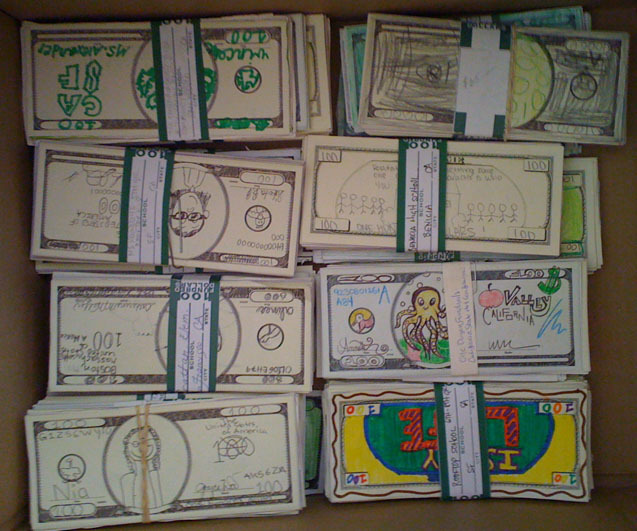 Last November 2013, the students of Rooftop School received a very special present from Flo — their own art show. Rooftop Art’s “A Slice of Life” at the Luggage Store Annex was a companion show to Flo’s 75th birthday show, “The Whole Pie.” As a nod to Flo’s interest in poetry, visitors were invited to stroll through the Tenderloin National Forest to read poems written by Ms. Woo’s 4th graders. This year, as Flo celebrated her 76th birthday with family in New York, Flo revealed that she was working on a new project with her granddaughter Sasha. 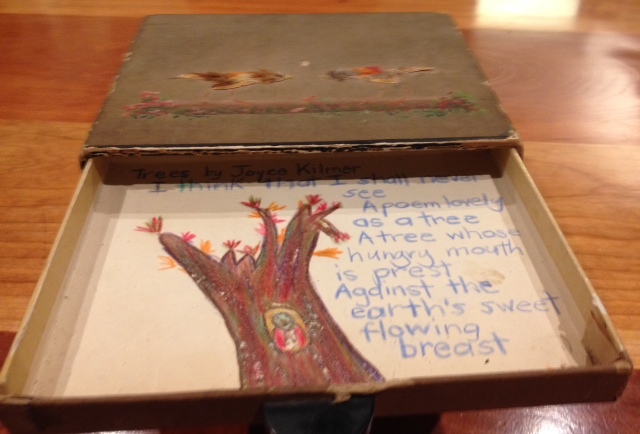 As a visiting artist in Sasha’s classroom, Flo used visual art to help children to see the poetry in trees. At home, Flo and Sasha worked together to make a very special tree box. We thank Flo, Sasha and Ms. Robin Farrell’s 3rd grade class at Hillside Elementary School in Hastings-on-Hudson, New York for sharing their process, their art, and their mutual love of trees. 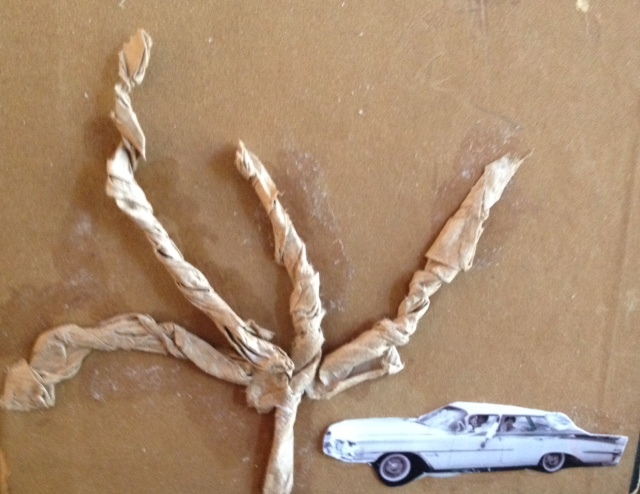 FLO: My tree project with Sasha started when I was home in Sunnyvale. I took pictures of these trees when I was going on daily walks. I sent them to Sasha after she asked to see the tree trunks I was talking about. My husband Ed knew about my tree-sharing and he began to point out trees to me. There was one, in particular, which inspired me to write my poem, Tree Trunk. Fast forward to mid-October when I taught a tree-drawing lesson in her 3rd grade class. The day before the other lesson her teacher selected, Sasha gave me input. She told me she didn’t want me to repeat what I had taught in her 2nd grade class. Flo suggested that the class learn how to draw trees, a spontaneous decision that met with Sasha’s approval. Flo discussed trees, focusing mainly on color of trunks. After demonstrating how to draw a tree Flo told the 3rd graders they could draw either realistic or fantasy trees. The criteria? They had to fill their paper top to bottom, side to side. She introduced them to non-dominant hand drawing and requested one tree be drawn with their non-dominant hand. Then, the students needed to create interest in the negative spaces. They also wrote tree stories. One boy, a ballet dancer at the Met, drew a dancing tree. A girl created one with swirling energy in the trees and the surrounding environment. The hour lesson turned the students into vibrant and energetic tree detectives. When the class was through, Sasha conducted an exit interview with her grandmother about the lesson. Sasha’s critique: She would have cut back the drawing time so more artists could share their work with her grandmother. 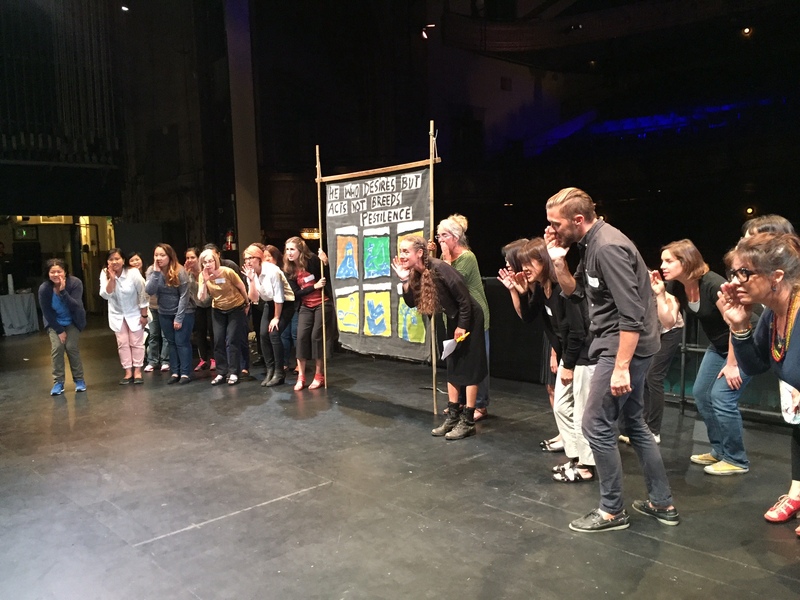 FLO: What I liked so much about the lesson was this – I integrated my love of poetry and art for this eye-opening, heartwarming classroom experience. In the evening at home Sasha and I memorized Joyce Kilmer’s poem. We recited it around the dinner table. Sasha memorizes Joyce Kilmer’s poem Trees, just as her grandmother had done when she was a young student at Lincoln School in Oakland Chinatown. Flo learned and recited Trees for a tree planting ceremony. She recalled, “We buried a time box with the tree. I wonder if our box has been uncovered. I have remembered Trees for over 60 years.” Sasha and Flo also listened to Louis Armstrong and Paul Robeson sing their musical settings of Kilmer’s poem. 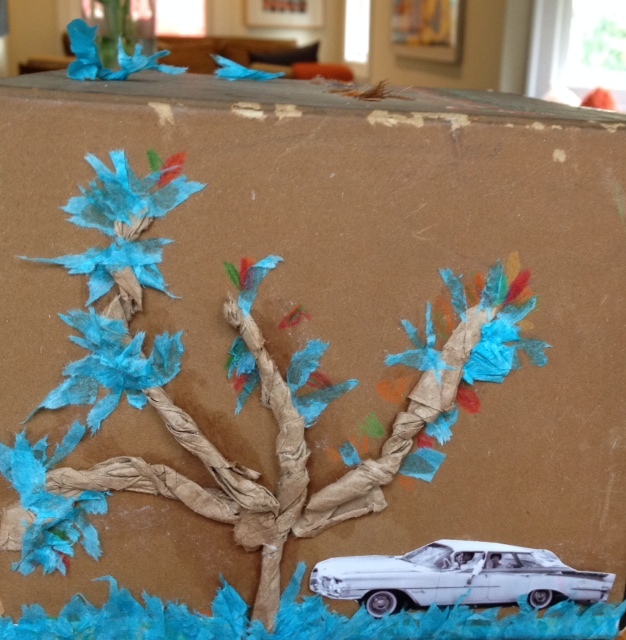 When Sasha and Flo find a 1930s box at the local antique store, they decided to make a box tree art project. Sasha includes Joyce Kilmer’s poem (partial) and her Paw Paw’s poem. Flo adds some color atop of the colored pencils Sasha used to render the tree. 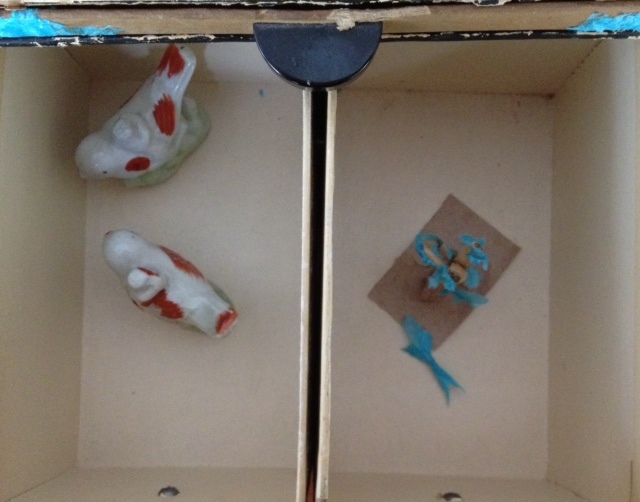 Sasha includes two blue porcelain miniature birds that she has purchased from the antique store. Sasha makes a tree out of a paper bag fragment to add to the tree box. As a surprise, Flo adds a bird to the lower right front of the box, while Sasha is away at school. When the box is finished, grandmother and granddaughter take some time to reflect on the process of making The Tree Box together. Flo and Sasha use Flo’s iPhone to record their shared memory of three and a half weeks of bonding and intergenerational learning. 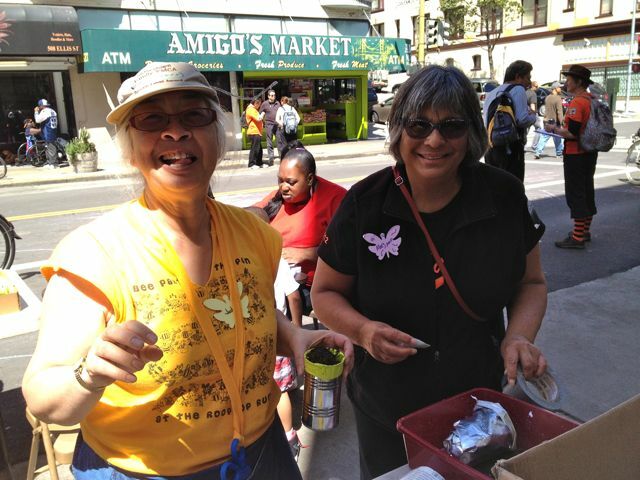 On Sunday, April 13, The Luggage Store Annex and ArtsEd4All partnered to bring The Butterfly Effect to Sunday Streets in the Tenderloin. In support of Makeway for Monarch’s “Call for Contemplation and Action for Monarchs and Other Imperiled Pollinators” marking the 50th Anniversary of the passing of author Rachel Carson. 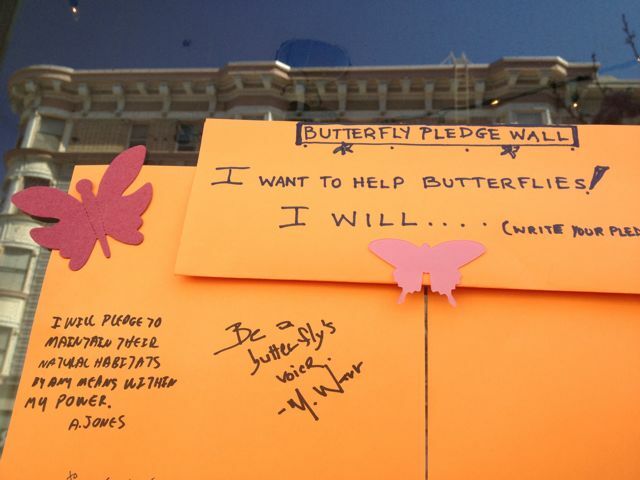 Visitors to the stretch of Ellis Street between Hyde and Leavenworth were invited to learn more about the plight of the monarch butterfly. Butterfly-inspired art activities included bookmaking with Mary Ann Cruz with support from Academy of Art University School of Interior Architecture & Design student volunteers. “Got Milkweed?” Judy Toupin invited passersby to try their hand at planting. Milkweed plants were on display, and The Pollinator Project provided information about how to create pollinator gardens and raised awareness for the protection of butterflies, and their habitats and migratory paths. 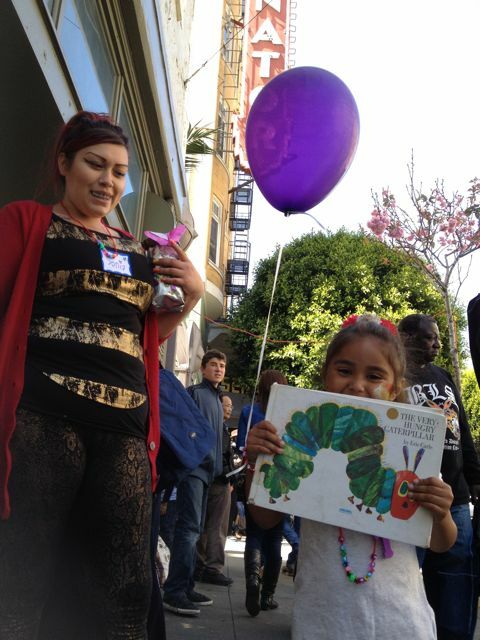 Young readers were invited to learn more with the Little Free Library #9859, which was filled with books about caterpillars, butterflies and other pollinators, along with a special contribution of specially selected titles donated by Chronicle Books. “Butterfly Wings,” a special photo booth created by Rooftop School art coordinators Amy Balsbaugh and Cheryl Ball, with help from the students in Ms. Duff’s first grade class, invited passersby to transform themselves into beautiful monarch butterflies. Crowds gathered in the street to enjoy special musical performances by Rooftop’s rock bands Blade and C&R directed by Mike Rao of The Blue Bear School of Music. The street entertainment culminated with Mark Heinrich’s dramatic reading of Ray Bradbury’s science fiction classic, “The Sound of Thunder,” a cautionary tale involving time travel, dinosaurs and a lone butterfly. 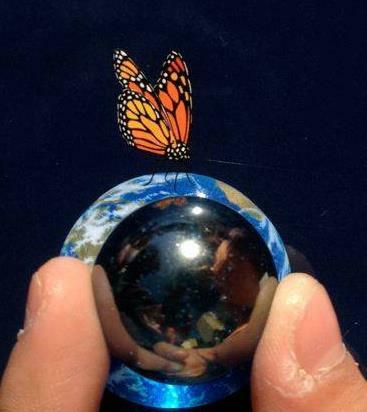 Blue Marbles were given in gratitude to all who pledged to use their voice to help protect the monarch butterfly for future generations. The Butterfly Effect posits that the flap of a butterfly’s wings can set great winds of change in motion, so it was only fitting that as Sunday Streets drew to a close, Lucia of Michoacán should appear on Ellis Street to share childhood memories of forests, dense with the wondrous fluttering of orange and black.